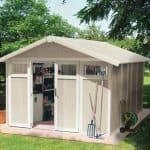 The keter plastic sheds range – The Keter shed has strong plastic floor panels which mean that your ground area will always remain dry. 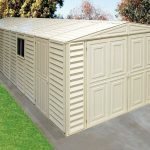 Coupled with an excellent ventilation system preventing pests from entering and allowing plenty of air circulation therefore making it a comfortable space to enter it is a great storage solution. 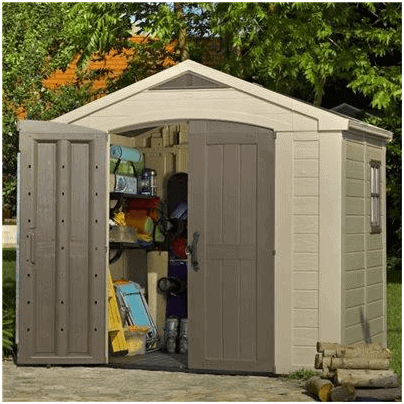 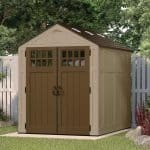 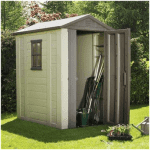 This particular shed has wide double doors allowing easy access to the gardening equipment you need, a skylight for plenty of light inside and a pretty feature window making this a very attractive outbuilding. 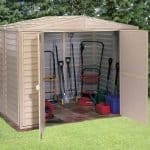 It is completely weather resistant and maintenance free and easy to assemble – a wise choice among gardeners.